San Francisco playwright Christopher Chen has brains for days (and days) and a theatrical sense that runs from absurdist comedy to political thriller. He reins in some – not all – of his wildest theatrical impulses for his latest world premiere, You Mean to Do Me Harm, a production of the San Francisco Playhouse’s new play development program known as the Sandbox Series. There are only four characters in Harm: two married couples, each comprising a Caucasian-American and a Chinese-American partner. That’s important because Chen, in this incisive 80-minute play, is using mixed-race marriage to dive deep into the notion that when it comes right down to it, geopolitical machinations are essentially global manifestations of our personal relationships to others, to our particular life experience and to ourselves. Spoiler alert: that paints a pretty bleak scenario. 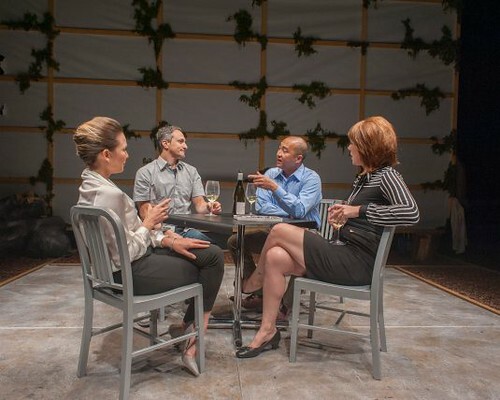 The play, performed in the black-box Rueff at ACT’s Strand Theater, begins as a quartet as the two couples meet for a good-natured dinner. The wife of one couple and the husband of the other went to college together and dated, but that’s all in the past (10 whole years ago). That the two characters with history happen to be the white ones is going to turn out to be important. There’s also another reason for the party. It turns out that one of the husbands, who has been unemployed since his wife was promoted and he was laid off at the same company, is now going to be working with the other husband at an up-and-coming search engine called Flashpoint. Daniel’s wife, Lindsey (Lauren English) is in corporate law, and when she is prompted to weigh in on the discussion of China-America relations, she does the kind of geopolitical parsing out “degrees of shittiness” on all sides that would make cable news networks shimmy with delight. But Samantha (Charisse Loriaux), Ben’s wife, wants to challenge that notion and cites a “fairness bias.” Things could get contentious here, but everyone is in a good mood (the wine helps), and everyone is a grown-up, so the conversation grinds, bumps and steadies to the point where everyone raises a glass to the Cold War. And that’s just the first scene. What follows is a series of duets that break down the racism and micro-aggressions and traps and betrayals of that seemingly benign evening. By fueling his drama with racial and cultural differences, Chen is able to quickly establish the shaky ground underneath most relationships, especially when it comes to being honest, really honest. That two people can live together (to say nothing of being truly honest) seems, at best, an unlikely notion, without some sort of peace treaty: what will be ignored, what will be allowed (or not), what will be forgiven. The depth of anger and insecurity and dishonesty (subconscious or not) that comes up in both of the play’s relationships is astonishing, and the level to which Chen is able to take us in such a short time is remarkable. At certain points, the naturalism of the play is pushed aside, but it works because there are discussions here that benefit from loosening the bonds of reality. As heavy as this subject matter is, there’s a crackling energy to the production that keeps it from bogging down or slipping into clichés about race or relationships. Chen is too smart for that, and it also helps that no one is a bad guy unless everyone is a bad guy. They’re complicated humans with rich intellect and deep roots. Life is hard for them, and though the play simply stops more than it ends, it seems life will keep getting harder, and the poisons of the world will continue to corrode us personally and politically. 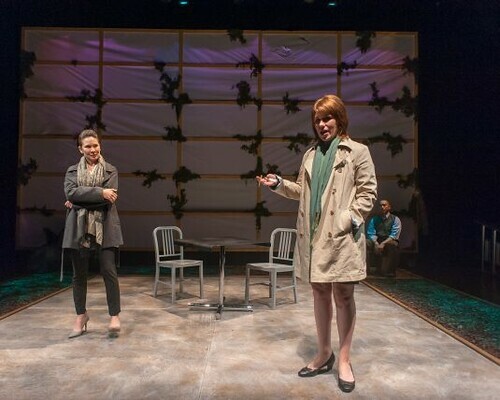 Christopher Chen’s You Mean to Do Me Harm continues through July 2 in a San Francisco Playhouse production at the Rueff at The Strand Theater, 1127 Market St., San Francisco. Tickets are $20 and up. Call 415-677-9596 or visit www.sfplayhouse.org.